With the holidays right around the corners, and the sales on so many items at various stores, inventory management is crucial during these times. Not only are large quantities expected to be in inventory but also excess inventory to continually carry the stores throughout the holiday season all the way passed Christmas. Walmart announced that its Black Friday sale will start at 8p.m. on Thursday, November 22. Many big named brand items have already been announced for customers to start placing on their wishlists. Despite such an increased expected demand, Walmart will guarantee products to customers by giving them what they call guarnatee cards, that will ensure that customers get the item they wanted before Christmas at the advertised Black Friday price. Walmart is even going as far as having three rounds of sales to be able to keep up with the high demand of items on sale, especially electronics. Do you think the Walmart should purposefully order more merchandise to account for such high demand during the holiday times or do you think that the products that they do have available on hand are excess items ordered previously throughout the year that has just sat in holding inventory? How might Walmart be able to access ordering trends and be able to supply enough of the items that are in high demand? This post was really enjoyable to read because it relates directly to what we have been talking about in class, as well as the up and coming holiday season in society. It is unbelievable that Walmart is opening their doors at 8 PM on Thanksgiving evening! Also, their guarantee cards are a very interesting way to ensure that they are meeting the demand of their customers. However, if they feel the need to open so early on Black Friday and offer such cards, it would seem to make more sense for them to offer more merchandise during this period of high demand. If they are already forecasting that they will need the guarantee cards, then I wonder why they would not just bring more of their inventory into the stores during this period of high sales and traffic in the stores? I found this post to be interesting because it directly relates to what we have been learning in class about inventory and forecasting. Walmart has always been one of the big stores that has the best deals during the holidays. I personally am one of those shoppers that goes out on Black Friday and wait in line to get the best prices. I think Walmart is smart in opening their doors early but I feel that this would only cause more chaos. One of the thing that Walmart does well is brings in customers, that’s what opening their doors early is doing. The catch is that none of their sales start until a specific time on Black Friday. However, the fact that they are now offering guarantee cards should help lower all the holiday chaos. With all that Walmart is doing, opening early and offering these cards, I agree with the above comment, that Walmart should just have more inventory on hand. If they’ve forecasted high demand of certain products for this holiday season then they should have plenty of that product in their inventory. I would also think Walmart would have overstock in their inventory if they’ve forecasted such a high demand. While opening early and guarantee cards are great, customers want to be able to go into Walmart and be able to leave Walmart with their said purchases. Coming back at a later time or waiting until a certain time for the sales could lead to unsatisfied customers. I think Walmart should purposefully order more merchandise to account for such high demand only if they are able to forecast the demand accurately. As we learned from the inventory management chapter, inventory is one of the most expensive assets of many companies. Therefore, it is important that they know how to manage their inventory effectively by ordering their merchandise at the right time and right amount to keep their inventory cost low and avoid stockout. To answer your question, Walmart should consider the concept of safety stock when ordering products. This is because it would be a costly mistake for them if they encounter a shortage. A stockout may result in a lost of profit and future sales and reduce their good will. However, they should not order too much merchandise since it will lead to a high holding cost. Lastly, I agree with “f1221mcaruvana” that Walmart has made the right decision to open their stores early. This way they can attract more customers to shop at their stores. I think Wal-Mart should purposefully order more inventory because demand will probably increase more than they have seen before because of their store opening now at 8 on Thanksgiving. Not only for Wal-Mart but for many of these super-stores that do Black Friday specials because it will eventually get to a point where they only have 100 tvs for a very low price but 400 people waiting outside in line that want that same tv. Most of the time the products on hand are excess inventory mixed in but Wal-Mart would not be a desirable place to start holiday shopping if it didn’t have the newest and greatest products that everyone wanted. I think that Wal-Mart has the right idea in giving out those guarantee cards, many people get frustrated on Black Friday because they wanted something and the store’s inventory was not ready for the amount of people who want that particular item. This will ensure many more happy customers, causing a higher rate of people who will come back in the future. However, if Wal-Mart would order more merchandise from the beginning, this would help avoid the need for those guarantee cards or at least not as many would need to be handed out and used. Some items they can predict that people will want more of, it is a given. You bring up an interesting point in questioning whether those items they have on the shelves are just items that they have had throughout the year. Wal-Mart should look at the buying patterns of items, especially items that have been popular to help them predict how much of an particular item would be needed on this particular day and during the holiday season. It is obvious that their count many now be 100% accurate, however it would help them get an educated guess on how many of a certain product they might need. I think that Wal-Mart is doing a good idea on providing customers with guarantee cards but I don’t know how that will work because I think that inventory will be an issue in that part. I think that inventory will be a huge issue and they have shortage if they don’t make sure that the demand is accurate and in order to make the demand of the inventory is accurate they need to forecast their entire inventory and make sure all of the numbers are correct to avoid any problems with customers and to make their customers will remain happy at the end. So I don’t think that they have enough in hand they need to be sure to have good amount of inventory available especially if they are giving a good deal on a certain idea. I think that this is a good idea of stocking up on inventory. Not only will Wal-Mart get more customers because they are guaranteed to have what they want instead of looking around at other stores. So by insuring this guarantee card I think will only boost sales for Wal-Mart. The only problem I see is that they might not have enough room for such a big demand, but maybe having shipment of products that same day ready could hold up the demand. I think it’s a good idea for Walmart to start up for Black Friday since they are one of the main department stores that grabs a lot of consumer’s attention during the holidays especially since they sell merchandise that is slightly lowered than other department stores. Only problem would be they should look into which merchandise they think will be a top seller before “stocking” up versus having to have a lot in backstock once the holidays are over and are forced to have them go on markdown. This article really does a good job at explaining what exactly we have been learning in class with inventory forecasting and demand. With inventory being one of the companys greatest cost, I think Walmart will really need to focus on forecasting an accurate demand. I think that passing out the cards will help also after the Thanksgiving sales to determine how much more they will need to order based of the cards they hand out if the item is out of stock. It is interesting that they are doing that this year, maybe to better track their inventory needs. Also, like f1232al said, I think that it is important that the company determine what merchandise they think will be the top seller and will need the most inventory before stocking up on everything because of the costs. I doubt that the Black Friday sale items are older items that have been sitting in inventory. The guarantee cards are a way to give their customers confidence that they can get the sale items at a great price while keeping their inventory costs down. I think they are going to have a lot on hand but also, the idea of giving the customer a card if they run out is a good idea. If you have a lot of inventory leftover, you dont know what will sell and how long. I think they have a bright enough staff to figure out what to order and how much of it though. They just need to figure out what will sell more than other things, such as new video games that came out or any other type of electronic device, which is what usually sells first before anything else. Walmart’s provided information about guarantee cards offers very little insight into how Walmart will address inventory management for the shopping season. Having your items delivered by Christmas is a vague promise in today’s advanced shipping world, and this years plan looks like a test run for a program that could continue for several years. Walmart is known to be a unrealistically demanding business partner for their suppliers, and is it seems plausible that Walmart uses “business tactics’ to reduce the scope of their need for advanced forecasting information, and transfer that responsibility to their individual product suppliers. If the guarantee cards are a success, this will give Walmart an opportunity to manage increasingly larger scale distribution of goods with virtually no oversight into the new burdens placed on the workers responsible for fulfilling the orders. I would like to see Walmart provide transparent information about their operations so that the public has an opportunity to evaluate the real cost of “lower prices, always”. You bring up some valid concerns. Planning for inventory during the holiday season is a daunting task for many corporations. I can only imagine that sales will be even more difficult to forecast based on the current state of the economy. In a perfect world corporations would only carry enough inventory to meet demand. As we know, that’s nearly impossible to accomplish in the real world. It is my understanding that corporations will generally plan to keep inventory at levels to meet the “best case scenario” demand in the market. This will ensure they capture every sale possible, but with an understanding that they will typically have some inventory that goes unsold. Your post was interesting and relevant with the holiday seasons rolling in. It can be difficult to forecast demand, manage inventory and supply chain. Seasonal sales and managing inventory is difficult—especially in today’s economy. Walmart has a unique idea/system to guarantee products with the ‘cards’ to reserve the sale products they want. This will help customer satisfaction and inventory management—so you know exactly how much of a sale product will be sold. I think Walmart should purposefully order more merchandise to account for such high demand during the holiday seasons because Walmart is such a large organization that it can turnover a lot of inventory (if excess is on hand). If some merchandise is left over for a little while, it will not accumulate much carrying costs. The demand will be high enough during the holidays and consistent after they pass to have a lot of products produced/ordered. I thiink the idea of a guarantee card is brilliant to solve this problem perfectly. If Walmart purposefully orders more merchandise to account for such high demand during the holiday times, it would have to take a big risk of invenory fee in the future if there are a lot of good left. 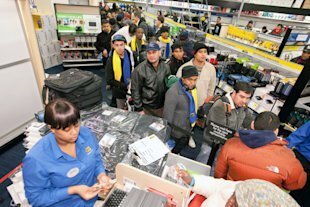 In another hand, if they just sat on holding inventory, they may not satisfy the demand in holiday season and lower the customer loyalty. However, the guaratee card casn solve the shortcoming of both method mentioned before because they don’t need to take risk of inventory but fulfill the demand perfectly. This idea can be spread to normal time if needed. I thought this post was very interesting. As others have commented, it shows how inventory and customer service go hand-in-hand and how inventory turnover can really affect the bottom line. My thought is that the different Walmart Distribution Centers will be able to hold more stock on-hand, giving the individual stores flexibility when it comes to customer demand for that area. The cards will lock in the sale with the customer, not only confirming the sale, but making sure that the customer doesn’t go somewhere else. The card would give the stores a better feel of how much inventory is needed to fulfill demand, although there will always be some walk-in customers where extra inventory is required. This post was extremely interesting as I feel like holiday shopping continues to become more and more extreme. Retailers have to keep up with trends and do their best to supply what their customers want in order to make the biggest profit. I think that the guarantee cards that Walmart set up were a great idea. In order to ensure they have enough merchandise, they could have a system set up in which customers put in orders a few months ahead of time and Walmart has the products ready to go when the holidays come around. The only problem with this solution is the fact that not every customer may know what they want to buy at the holidays several months before. I enjoyed reading this post as it relates directly to issues that we are all involved in during Christmas. You need to get that extra iPad for your niece or that rainbow looms package, but its not there. Now what? I think stores should do a better job of predicting its demand on specific items over the holidays, and adjust its inventory accordingly. However, having more inventory isn’t always good for a few reasons. Having worked for a major electronic retailer I am quite aware of what can potentially happen to large amounts of inventory during busy season. Not only do stores allow more items to be easier accessible without having to get a key etc, but in the back it also creates issues with unethical staff stealing electronics. In this scenario stores that do expand their inventory for such events should be mindful of that and put in effect special rules, and procedures.